Create stunning effects by combining multiple PowerPoint custom animations. 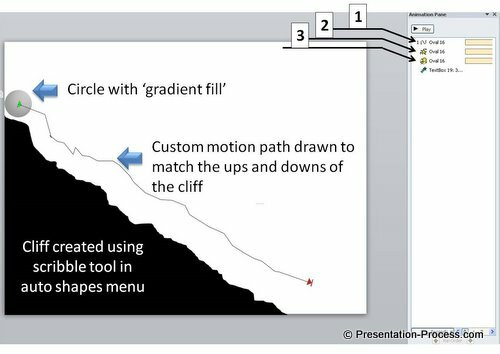 Learn to create snowball effect in PowerPoint and download the pptx file with animation for free. The effect showcases the power of combining multiple animations. You can use this concept slide in any of your business presentations. You will find a link to download this PPTX slide later in the tutorial. Using the right animation in PowerPoint diagrams helps you convey your message with impact. You can see the value of custom animations in building information here. Here are some examples to highlight the effectiveness of combining animations in a presentation slide. These diagram templates are part of the PowerPoint Charts and Diagrams CEO Pack Volume 1. Please view the animation below to see the power of multiple ‘fly in’ animations with ‘delay’. Each step comes on click. So the presenter will have the time to explain the steps in detail. The impact is achieved by using multiple ‘fly in’ animations. The following screenshot explains the method. We used the ‘scribble’ tool in auto shapes menu to create the cliff. The tool helps you get the rough surface much better than ‘curve’ tool or ‘free form’ tool. We filled the shape with black. We added a circle and filled it with gradient. We set the fill direction be ‘radial’ and used shades of grey to achieve the snowball look. We let the ball grow in size simultaneously by using ‘Grow/Shrink’ animation. We let it grow to 300%. We made all the three animations happen at the same time by using ‘with previous’ option. You can download the PowerPoint slide containing the snowball effect here. Just Right Click on the button below and select the Save As option to save it to your desktop. If you are a busy presenter, and you liked the templates showcased in this article, you may like to browse through the PowerPoint Charts and Diagrams CEO Pack (Volume 1). The pack that has 750+ unique and editable charts for business presenters. Why waste time creating your charts & animations from scratch, when you have such a high quality solution available off the shelf?